Run by Oakland nonprofit Grid Alternatives, the effort will install home solar arrays in disadvantaged neighborhoods, using $14.7 million raised through California’s cap-and-trade system for reining in greenhouse gas emissions. That system forces factories, power plants, oil refineries and other large businesses to buy credits for every ton of carbon dioxide and other heat-trapping gases they pump into the atmosphere . . . Most homeowners are asked to make small contributions for the installation, such as agreeing to feed the crew installing the array, or agreeing to help with the installation themselves. Otherwise, it’s free. The arrays will save most homeowners $400 to $1,000 per year on electricity, depending on where they live. 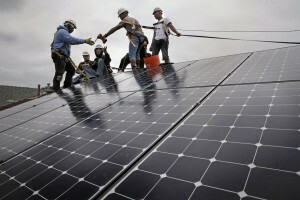 This entry was posted in NewsBlog, Solar for Lower-Income Households and tagged Community Power Network, David R. Baker, Jake Brown, Low Income Home Energy Assistance Program (LIHEAP), Nebraskans for Solar, San Francisco Chronicle, solar energy as economic development, solar energy as poverty mitigation, solar powering low-income housing on May 27, 2015 by Helen Deffenbacher.